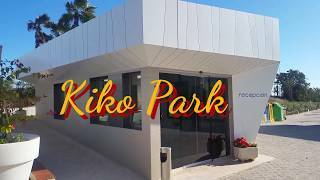 Kiko Park is a smart site nestling behind protective sand dunes alongside a Blue Flag beach. There are sets of attractively tiled steps over the dunes or a long boardwalk near the beach bar (good for prams and wheelchairs) to take you to the fine white sandy beach and the sea. From the central reception point (where good English is spoken), flat, fine gravel pitches and access roads are divided to the left and right. Backing onto one another, the 180 large pitches all have electricity and the aim is to progressively upgrade all these with full services. There are plenty of flowers, hedging and trees adding shade, privacy and colour. A pleasant, outdoor swimming pool with adjacent children’s pool has a paved area with a bar in summer. The restaurant (lunchtimes only out of season) overlooks the marina, beautiful beach and sea. A wide variety of entertainment is provided all year and Spanish lessons are taught along with dance classes and aerobics during the winter. The site is run by the second generation of a family involved in camping for 30 years and their experience shows. They are brilliantly supported by a friendly, efficient team who speak many languages. The narrow roads leading to the site can be a little challenging for very large units but it is worth the effort. Four heated shower and toilet blocks, including facilities for babies and for disabled visitors (who will find this site flat and convenient). Outdoor swimming pools. ATM. Laundry. Restaurant, bar and beach-side bar. Supermarket. Motorhome services. Gas supplies. Playground. Watersports facilities. Diving school in high season. Paddle Sup. Entertainment for children. Pétanque. WiFi. Car rental. Bicycle hire. From the AP7 take exit 61. From the toll turn right at T-junction and continue to lights. Turn left then at roundabout turn right. At next roundabout (fountains) take third exit signed Platja and Alicante. Follow one way system to next roundabout then site signs.